Cartoon Movie, the co-production forum for animated feature films, today announced the winners of the Cartoon Tributes, the most prestigious awards given to European animation professionals. The Basque production company Kanaki Films won the European Producer of the Year Award for the animated feature Another Day of Life, a European co-production based on the novel of the same name by the acclaimed Polish journalist Ryszard Kapuscinski, and directed by Raúl de la Fuente and Damian Nenow (Poland). 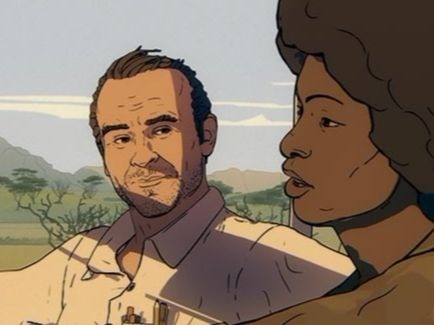 The animated film stars Kapuscinski, Polish journalist, idealist and friend of lost causes. In 1975 he travels to the war in Angola, where the young soldiers of Cuba, Russia, South Africa, Portugal and Angola fight a forgotten war of global repercussions. Kapuscinski embarks on a suicide journey into the heart of darkness. Angola and the people he meets there, like the young guerrilla fighter Carlota, will change him forever. Raúl de la Fuente, now in Bordeaux, said that he was excited about the beginning of the film´s journey: today at Cartoon Movies, 15 minutes of Another Day of Life was screened for the first time to very positive reviews. Another Day of Life is produced with the participation of TVE, ETB and Movistar + and with support from ICAA, the Basque Government and the Government of Navarra. The film will be released in cinemas by the Navarre distributor GOLEM in the last half of the year. Kanaki Films has produced numerous shorts and feature films, including Minerita, finalist for the 88th edition of the Oscars and winner of the Goya for the Best Spanish Documentary Short Film in 2014. Every year, the Cartoon Tributes awards acknowledge the most important contributions to the development of the animation industry in Europe.